Hair fall in women is more common as compared to men, almost 40% of women suffering from hair fall. Men facing the baldness issue, women may or may not have baldness but hair fall is definitely there. Most of the women totally ignore the situation of hair loss and it makes the situation worse and it ultimately leads to stress, embarrassment, and depression. How Common Hair Loss in Women? Hair loss in women is very much common. Almost 30 million women in India are facing hair loss issue. How to Identify the Hair Loss is Normal or Not? Generally, 50 to 100 hair loss per day considered as normal. If you think that you have a hair loss issue, first you need to know the average amount of hair you are losing per day. For this, you need to count the hair falling from your head, start noticing the total number of hair in pillow, comb and during the hair wash. Make a note of the same for 2 weeks, and if you think that the average number of hair fall is more than 100/day than it is the right time to take a help from hair expert doctor. Nutritional deficiency – This is one of the main reason for hair loss in female, Iron deficiency is very common in Indian females. At our clinic, we are collecting data for Vitamin B12, Vitamin D and Serum Ferritin level of hair loss patients. The majority are having a very low level. After the correction of this nutrient level, their hair loss is improved to a great extent. Androgenetic Alopecia – This is a heredity issue, it generally starts at the +30, but nowadays it may appear in early age as well. Lifestyle – If you are having a very unhealthy lifestyle you may face the hair fall issue. Stress – Stress is a major cause of hair loss. Pregnancy, thyroid disease can also lead to hair loss problem. Weight loss due to disease can cause hair fall problem. PCOD– Polycystic ovarian disease is the known cause of hair loss in women. This is because of hormonal imbalance. In this condition female have unwanted hair on chin; neck and extremities but have less hair on the scalp. Hair fall issue not only affect your appearance, it makes you feel under-confident, makes you an introvert, gives rise to problems like low self-esteem and depression. 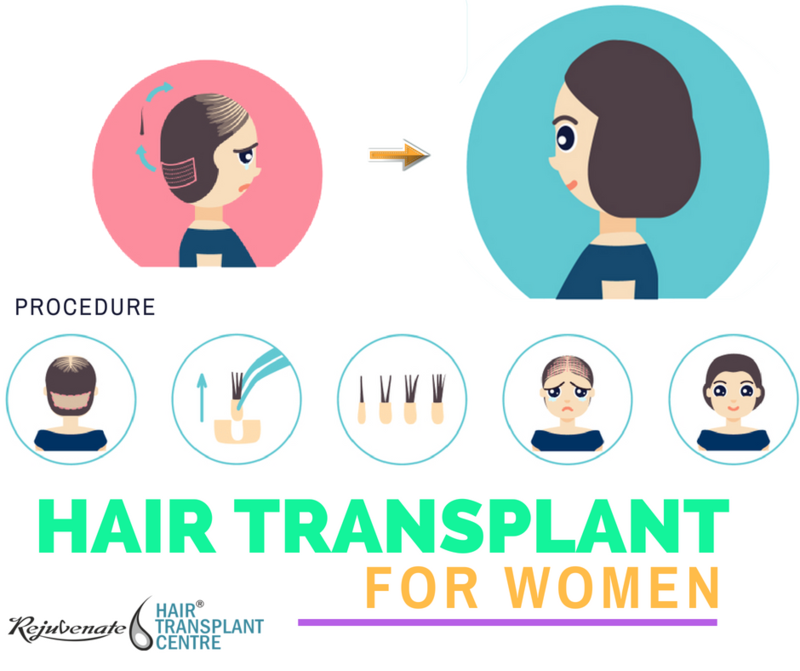 Hair transplant is not applicable if a woman having female patterned hair loss in this scenario we can’t consider that woman a good candidate for a hair transplant. The reason is an inadequate donor supply of hair. There are many conditions in which hair transplant is the best option to regrow the hair. Scars of burn or due to suture marks: In this condition, hair loss is due to the condition of trauma, hair transplant surgery is recommended and the best part is surgery hair transplant will help to fill the scar and vanish its visibility. A Female Version of Male Patterned Hair Loss – One can easily differentiate this condition. In this type of hair loss, hair falls from the front, crown, and top. Hairs from the sides and back area are not affected at all. Congenital Elevated Hairline: As the name suggests in this condition hairline starts from far back from the head that is why the appearance looks less feminine. Hair Loss after Facelift Procedures: Facelift procedures have become very common when you are going for facelift surgery, the next step after this surgery is hair transplant. After the facelift surgery hair from temporal points are lost and scar of facelift improvise the visibility of hair loss. Transgender Feminine Hairline Creation: During the male to female, transformational procedure, to make the appearance more feminine, hair transplant is recommended. Trichotillomania: This is a disorder in which patent has an urge to pull out his/her hairs from scalp, eyebrows. In this condition, bald patches mainly from the sides of the scalp will appear. This disorder can be treated with psychiatric but hair loss can only be recovered with the help of hair transplant. Traction Alopecia: This condition occurs when hair management is very poor, and one is using hair styling stuff like braiding, tight ponytails and dreads. When to go for Hair Transplant? What is the Difference between Male and Female Hair Transplant? Due to the long hair of women, the scar is less visible, that is why women can go for FUT for the high number of grafts. In women area of the donor site is comparatively high. In women hair transplant, body hair can’t be used. Here you can find before and after photographs of a female patient, she had undergone a hair transplant at our centre 1 year back to correct her hairline. 2200 Grafts were taken by FUT hair transplant procedure and implanted in the area marked to lower her hairline. In Female FUT is always a better option to take a number of grafts. The trichophytic closure is routinely done at our centre with all patients of FUT. Scars of FUT closed by trichophytic closure is almost invisible also females always keep their hair long. Special care is taken to give natural look. At our centre, we do “Powered hair transplant”. During the procedure, we keep the graft in plasma to provide the nutrition and use “no touch to root technique” for implantation. PRP is also done complimentary; it promotes the growth of the transplanted as well as non-transplanted hair. Her photographs are compared after 1 year of procedure; she is very happy and satisfied with the result.